Jamie Field is Head of Production at TopLine Comms, a UK-based integrated marketing consultancy. An experienced camera operator and video director, he has been producing animated and live-action content for a decade. You can reach him on Twitter at @TopLineJamie. As a head of production, the business of getting video in the hands of an audience is something I ordinarily leave to our clients. The issue is, though, that marketing professionals – my main points of contact – tend to focus on other areas and are at a loss when it comes to video distribution. Though traditionally not within the remit of a creative staff, the questions I get more than any others are about exposing video to the widest possible audience. 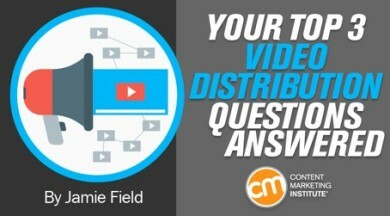 Using a combination of independent research and common sense, I’ve come up with a few answers to three of the most frequently received questions about video distribution. I’ve found that sharing the answers not only makes my life a little easier, it’s also proven quite useful to content marketers as well.